Editor’s note: Vik Singh is co-founder and CEO of Infer. Prior to founding Infer, he was an entrepreneur in residence at Sutter Hill Ventures. He has filed 13 patents in the areas of search, social networking, systems, and content optimization. According to industry expert David Raab, almost 70 percent of marketers are either unhappy or only marginally happy with their marketing automation software. According to Bluewolf’s new “State of Salesforce” study, only 7 percent are seeing good, measurable ROI from those investments. There’s a lot of fragmentation and dissatisfaction in this category despite the huge potential benefits of automating marketing. For example, you might set up a flow like this: “If a user clicks this link and then clicks that link twice, then in two days send this email…” That is so hard-coded. If you change your website design, this workflow (which will likely be buried by many others) could break. Such a low-level approach to configuration loses any chance of adaptability. 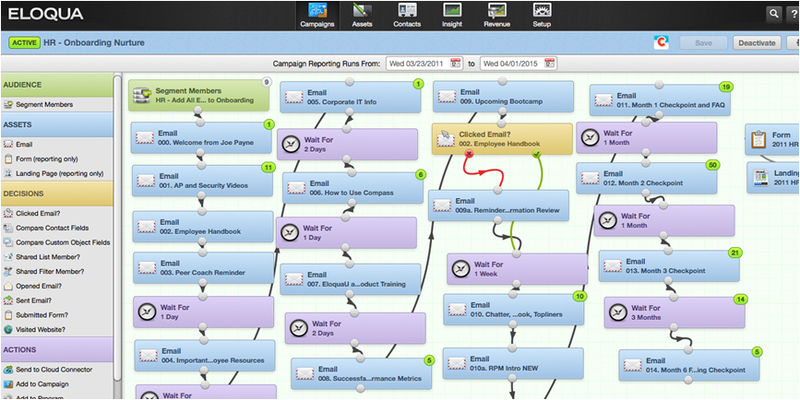 And what if the person who developed these workflows leaves your company? Workflow hell can also cause serious performance problems. I encountered one company where it took over eight hours for the marketing automation system to process all the workflows before passing a lead to the CRM system… that’s more than eight hours before a rep can touch that lead. 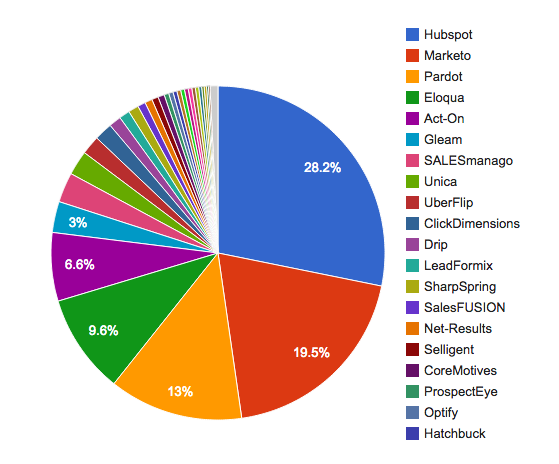 Where’s the speed, simplification and automation that marketing automation promised us? Which Marketing Platform Will Dominate in 2018? It is time to reinvent marketing automation. Platforms should provide scalable, incredibly fast and responsive database and workflow systems. They should be thinner and optimize for tracking the data about your leads and customers. They should provide clean APIs (that are from the 21st century) so third parties can build specialized, best-in-breed experiences on top of them. The good news is key ingredients are now coming together to prime a major shift in this direction – including vast external data sources, advanced data science and thousands of niche, more focused marketing apps. Over the next three years, we’ll see a new generation materialize. I predict that the prevailing marketing platform of 2018 will be predictive-first, will deliver full-circle recommendations and will embrace open platforms. The data science available to decipher all of the signals out there has evolved dramatically through major advances in practical machine learning (think Netflix movie recommendations). And with cheaper computing infrastructure, modeling can be scaled and personalized to each individual company. Companies like Conversica, Lytics, RelateIQ and Infer are democratizing predictive analytics and offering more efficient and effective solutions to old marketing automation challenges like lead nurturing, campaign optimization, prospect qualification, etc. Predictive intelligence is now table stakes for all businesses, and new platforms in combination with niche apps will make it more accessible and actionable end-to-end. They’ll be intuitive to use and will automatically adapt as your business evolves (with minimal manual effort or tedious configuration of clunky workflows), so you never have to worry about re-tuning or performance degradation. Predictive systems can learn, adapt and improve on their own with every customer action. As opposed to fueling the sales and marketing divide by keeping people siloed in different systems, future platforms will depoliticize customer data and bring all the functions together. Companies like KnowledgeTree are starting to do this by leveraging complete visibility across the sales and marketing funnel to determine the next best action or content to share. A customer prediction like this spans both sales and marketing. It learns from your historical sales data to model what a good lead looks like, and applies that intelligence to the top of the funnel, which cascades through your marketing programs and plumbs back down to sales to continue the cycle. If you shape the objective function of your predictive model to be optimizing for lifetime value as opposed to conversion, then that prediction can be used all the way down the funnel to help customer success teams load-balance customers. Next-generation marketing platforms will offer powerful open APIs — like those we see from Autopilot — so any company can build very focused and insightful best-of-breed tools that are 10 times better than a non-intelligent version baked into one of today’s all-encompassing platforms. For example, if you’re working on a nurture campaign, you’ll be able to run an app specialized in nurturing that leverages the predictive insights and scalability of this new thinner system to find leads in your neglected nurture database that score high or recently improved their score (due to recently visiting your web site, let’s say), and automatically apply a personalized email campaign or route those leads directly to sales reps. There are now almost 2,000 different marketing technologies out there – thanks to the rise of SaaS CRM and marketing automation, and the launch of the Salesforce AppExchange platform. There have been billion dollar businesses built on AppExchange, but we don’t see major successes like that built on marketing automation platforms because their ecosystems and APIs are still in their infancy. That’s a shame since there are so many best-of-breed apps out there that outdo the default or missing functionality in marketing automation. And I would contend that open marketing platforms hold the potential to be even more valuable from a data perspective than CRM, as they’re collecting information about your customers much earlier in the funnel and syncing bi-directionally with your CRM – giving you more data to party on. Our best shot at changing the game is to make predictive a layer in a thinner, more scalable data platform, and to tie in best-of-breed applications that are optimized to drive more conversions and wins. Predictive-first software is eating the world, and it’s about to sink its teeth into marketing and sales. Get ready.